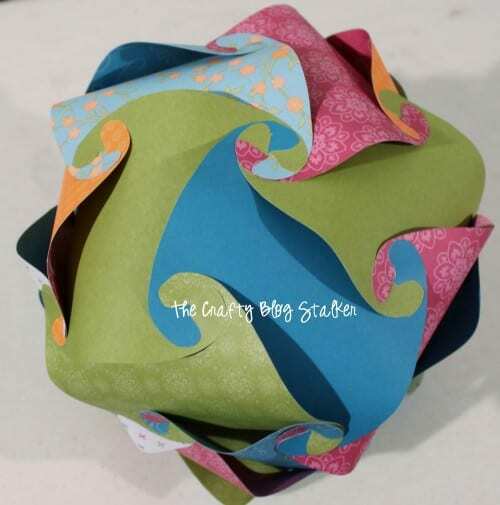 Make a Paper Sphere! Fun party decorations or beautiful home decor. An easy DIY craft tutorial idea perfect for any theme or event. Have you seen these Paper Spheres? I saw one at a woman’s show and thought it was absolutely amazing. 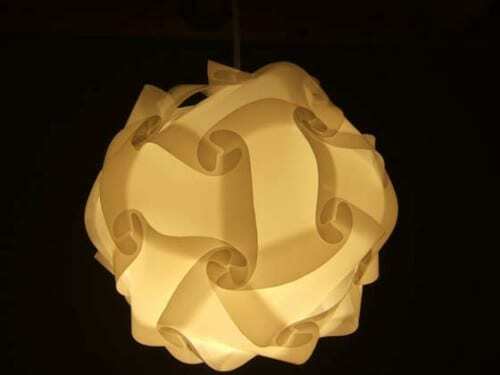 It was made out of plastic, not paper and was real lamp – how cool is that?! But the price tag was a little steep at $100 and decided I could easily make my own… right? While searching Pinterest for a project tutorial, I found this one and became super excited to get started. I found a tutorial on Instructables but had a hard time opening their template. I found pdf download template that I could open, so this tutorial came by combining the two. Print out the template and trace onto chipboard so you have a sturdy pattern piece that can easily be traced over and over again. 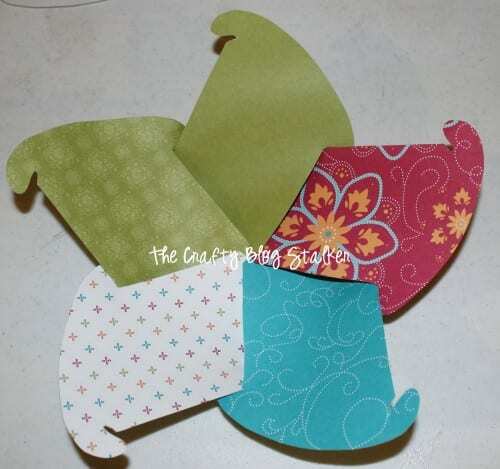 Trace and cut out 25 shapes out of the pattern scrapbook paper. I immediately started trying to assemble and it really is like a great big jigsaw puzzle. I tried for about an hour and was getting very, VERY frustrated because I couldn’t get it to work and I thought I was following the tutorial, but it still wasn’t working. I finally had to get up and walk away, or I was going to loose it. I let it sit for a couple of days and then sat down to try again. It still took me a while to figure it out, but I got it! YAY! So while Instructable’s tutorial is great I am going to add a couple of tidbits so hopefully, you won’t get as frustrated as I did. Just a warning: This is a difficult project. I will try to answer questions where I can, but it really just takes playing with it and figuring out how it all goes together. Following the tutorial, make your base. (I actually made two bases and then connected them together instead of building from the bottom up). This is the same piece turned over. Holding the base on your lap, put the next row on the base. Do that to both bases. What the sphere looks like looking in. Now, this is where it gets a really confusing. If you look at the pieces you will see that each side of the piece slopes in a different direction. For the first several steps, assemble all the pieces going the same way. The next row you are going to want to turn the pieces over so they slope in the opposite direction and assemble the next row. In the next picture, I tried to show you the direction of the pieces by using these signs < > as the direction of the piece. Only do this to one base because this is the center row. Put the 2 bases together, connect the tabs, and you have a sphere! Hang with a piece of ribbon or fishing line. This project was a doozy for me, BUT after all of the time I spent being completely ticked off at this project I was so glad that I figured it out! I hung it the corner of our family room where the kid’s computer sits. There is something so satisfying about finishing something that gave you such a hard time. It makes you appreciate it even more! 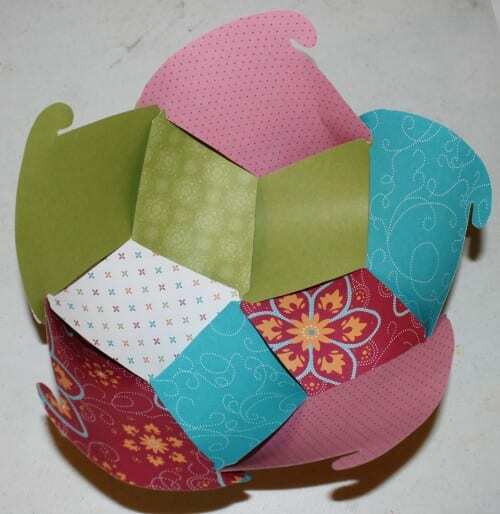 Where would you hang a paper sphere? Leave a comment below to share. 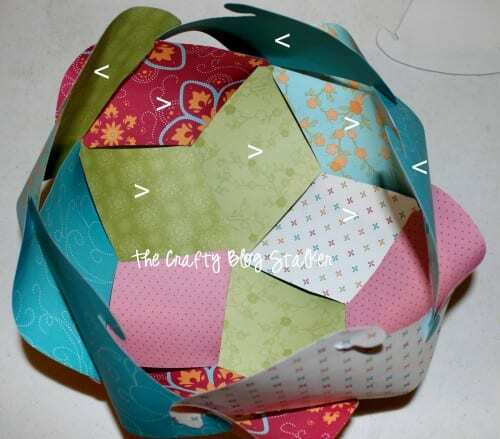 SAVE HOW TO MAKE A PAPER SPHERE TO YOUR FAVORITE PAPER CRAFTING PINTEREST BOARD! Glad you stuck with it because it looks really cool – and extremely difficult! Great job! Wow, this looks like it would be SO hard to assemble! The finished product is amazing though so good for you for sticking with it to the bitter end! Wow, this is Amazing! So glad it worked out. I probably wouldn’t have gone back but so glad you did. Thanks so much for linking up to Creative Thursday this week. I can’t wait to see what you link up next week. Have a great day. I have seen these as lamps… I didn’t realize it was DIY-able, but now I’d like to give it a try!! Thanks for the share! I’ve never seen these before but how cool is that!! Yours turned out great with all of those pretty colourful papers. Thanks for sharing at our party this week. 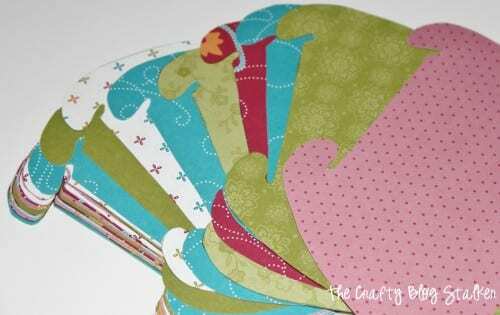 Hi Katie: I’m Connie at http://hotflashncraftn.blogspot.com/, a new GFC friend. I would love it if you stop over and be mine too. This is so cool, honestly just by looking at it, I had no idea it was paper. Very cool, thanks for sharing. I love it! Will have to give it a try – I love a challenge! This looks complicated, but sooo cool! Thanks for sharing at Terrific Tuesdays. I love it! The colors you chose are so fun. I have to check the tutorial to totally understand. Thanks so much for sharing at Whimsy Wednesdays. This is very interesting and intricate. Just the patience and technique alone! Thanks so much for sharing with us @ Toot Your Horn Tuesdays. Looking forward to what you link up next! Love it! I’d love for you to add it on my link party! Thanks! Very cool project! Glad you figured it out! This is cool…don’t know if I can handle it, though…my OCD says YES! !, my patience says NO! !, pinning just in case. Stopping by from Serendipity & Spice! This is beautiful! It would look cool hanging in a kids room too. I wonder if you could make really big ones? This is a stupid question, but where do I get chip board? Is it like plastic paper? Thanks for sharing! Pinned. Chipboard is basically lighter cardboard. 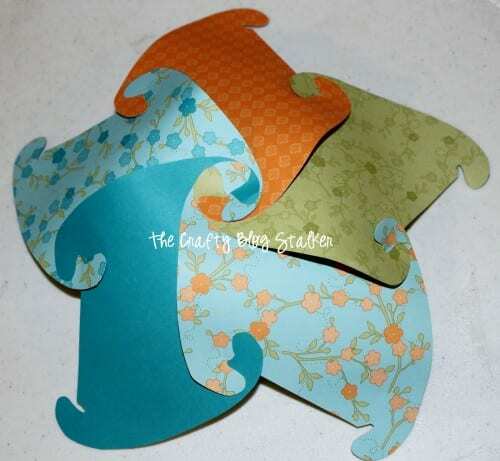 It is like th back piece of a notebook or a lot of times it is part of packaging like if you buy a pack of scrapbook paper. You can purchase sheets at most craft stores or you can just look around. You might have some lying around and not even realize it. Thank you for sharing how you made it work for you! Nikkie – I didn’t make mine out of plastic, I made mine out of paper. The plastic one was my inspiration. You totally should Mari! It looks awesome when finished. Thanks for stopping by. This was a great project! Took me a bit to figure out connecting everything, but totally worth it. I made one using the template at 50%, out of card stock that I plan on turning into a fancy topiary. I also made one at 25% out of sturdy construction paper, looks like a large Christmas ornament. I’m going to try shrinking it a little more to see if I can make it the size for ornaments that I like, and use them as gifts. Cool project, good instructions. Thanks!! Thank you, Theresa! A smaller ornament would be so cute!! !